The response from both Australian and international artists wanting to lend their support has been so overwhelming that an additional disc was added making it a special 3 CD set. "FLOOD RELIEF - Artists For The Flood Appeal" features 59 tracks over three CD's and features Aussie artists including Midnight Oil, Jessica Mauboy, Guy Sebastian, Tommy Emmanuel, Lee Kernaghan and Crowded House together with international artists such as P!nk, Keith Urban, Sting, Bon Jovi, Kings Of Leon, Beyonce, Billy Joel, Bruce Springsteen, Foo Fighters, John Mayer, Bob Dylan and Jeff Buckley. Sony Music proceeds from the sale of the CD will go to the Salvation Army Flood Appeal through the charitable arm of the Australian Sony Group of Companies, The Sony Foundation to support young people affected by the tragic floods. The floods in Queensland and throughout Australia have been devastating and affected the lives of so many people across the country. 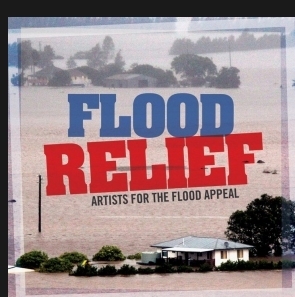 Sony Music Australia is once again proud to offer its support at a time of need through the release of this benefit CD - "FLOOD RELIEF - Artists For The Flood Appeal". We have been overwhelmed by the response by both local and international artists wanting to contribute to the cause and our thanks go to all those artists and songwriters for generously donating their tracks royalty free. We also thank Sony DADC Australia for kindly donating the CD manufacturing. The effect of this tragedy and its terrible toll on life, families, communities and property has touched many people both here and around the globe. On behalf of Sony Music and the Sony Foundation, our thoughts and prayers are with those affected, and our immense gratitude goes to all the emergency service people and volunteers who have so generously given in this time of need." Sony Music's "Bushfire AID - Artists For the Bushfire Appeal" CD which was released in 2009 in response the Victorian Bushfires, raised over $1.7 million and sold over 110,000 copies which was donated through the Salvation Army's Victorian Bushfires Recover Response Youth & Music Project. This project assisted youth of the affected areas through establishing a network of youth support and music programs. Email: tatiana.marchant@sonymusic.com or your local Sony Music Entertainment representative.